Everything you need is set up ready and waiting for you. Heated by radiators, and with large opening windows, keeping warm in winter is easy and cooling down in Summer is also a breeze. You can choose to have the bed made up as a King or 2 Singles and the couch folds out to a double bed as well. Please let us know in advance what you would prefer. The space includes an open plan kitchenette, combined lounge and bedroom space as well as a bathroom. The kitchenette has a bar fridge, microwave, sink, toaster, tea/coffee facilities, hotplate/cooktop and electric frying pan. There are no hidden costs. Linen, towels and exit clean are included in your nightly rental. There is access to washing and drying facilities on request. Noise needs to be kept to a minimum after 9pm. We have a very friendly, old dog in the main house named 'Jake'. Please let us know in advance if you would like the beds made up as 2x Single beds, or 1x Super King. Please also let us know if you would like the sofa bed made up. We are Taupo locals and are on hand to assist you with anything you need during your stay. Cute as a button, peaceful, clean, private and well-equipped! We provide some basic pantry items such as tea, coffee, sugar, salt & pepper. 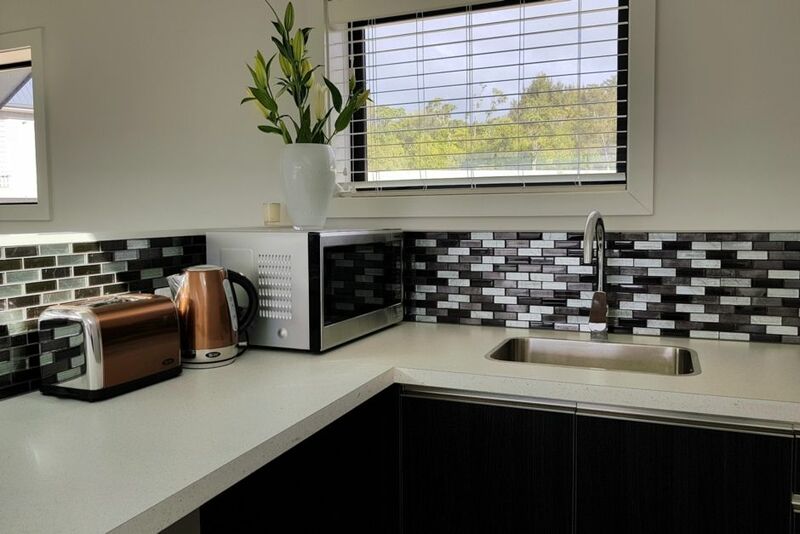 This property has a kitchenette with a microwave, electric frying pan, hot-plate, bar fridge, toaster, tea & coffee making facilities and kitchenware. There is room for 2 guests to sit at the kitchen bench using the bar stools. Please advise us in advance if you would like a high-chair to use during your stay. Please let us know ahead of time if you prefer to have the bedding set up as 1x King, or 2x singles. Please also let us know if you would like the sofa bed to be made up for you.